Note: This blog post has is also available at IBM DeveloperWorks. In a previous post, I explained the debug module and how to use it for basic debugging. I recently used it to help me understand complex interactions between events in Leaflet and Leaflet.Editable. Before going over that, however, I’m going to lay the groundwork with a couple organizational tips that makes debug easier to use. This post assumes you have either used debug or read the previous post…. …but don’t overdo it. Personally, I try not to go deeper than two or sometimes three levels. The “*" here matches identica, twitter, or any other string. Note: The code above uses ES2015 object property shorthand. Note: The code above uses the Bluebird promises library‘s tap function. …and quickly discover that a missing environment variable is causing the issue. My goal was to run my newFeatureAdded function whenever a user created a new “feature” on the map. 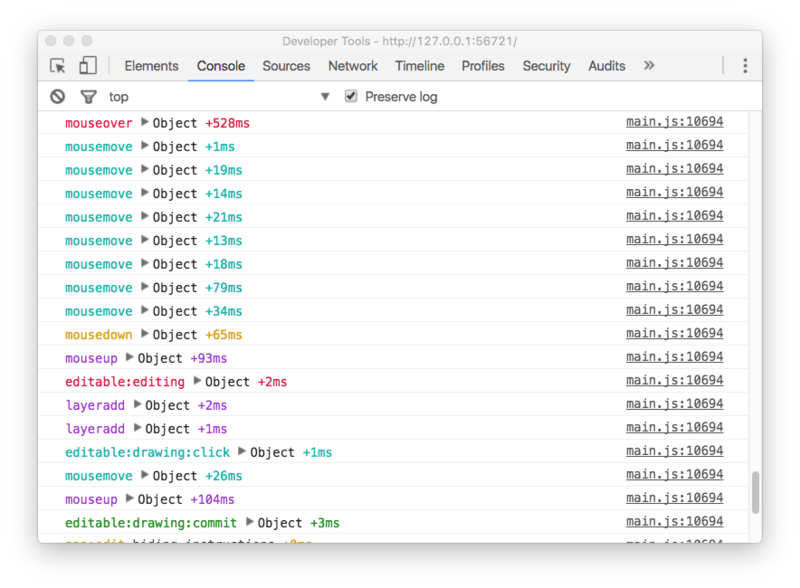 This example is browser-based, but the approach works just as well with Node.js EventEmiters. This is starting to look redundant, and doubly bad as it’s forcing me to wrap the handler calls in extra anonymous functions rather than delegate to them directly, for example map.on('click', disableEdits). Furthermore, not knowing the event system well, I want to discover other events that fire at times that might be useful. I could pore over the docs and source code to find the exact event for each eventuality… or I could attach debug loggers to all events and see what happens! Create an array of all known events. Create a debug function for each event. Attach that function to the target event emitter using .on. Assuming I set localStorage.debug='*' in the browser console, I will now see a debug statement in the console when any of the Leaflet.Editable events fire on the map object! Note that the data that .on() passes to an event handler target is also passed to the debug functions. In this case it’s the event object created by Leaflet, shown above in the console as ▶ Object. //editable events already prefixed with "editable", so "events:editable:..."
//map events not prefixed so we'll add `map`, so they're "events:map:..."
Conveniently, the Leaflet.Editable events are all already “namespaced” and colon-separated, just like our debug namespaces! Looks nice, but the mousemove events are coming so fast they push everything else out of the console–they are basically noise. Some trial and error taught me it that drag events are equally noisy and I don’t need to know the core map events most of the time, just the editable events. While debug is a very small module and easy to get started with, you can tune it in very granular ways and this makes it a powerful development tool. By attaching debug statements to all events, outside of our application code, you can trace the path of an event system and better understand how events interact, without adding any debug statements into your application code. If you’ve found another novel use of this library or have any questions about my post, let me know. Happy logging!